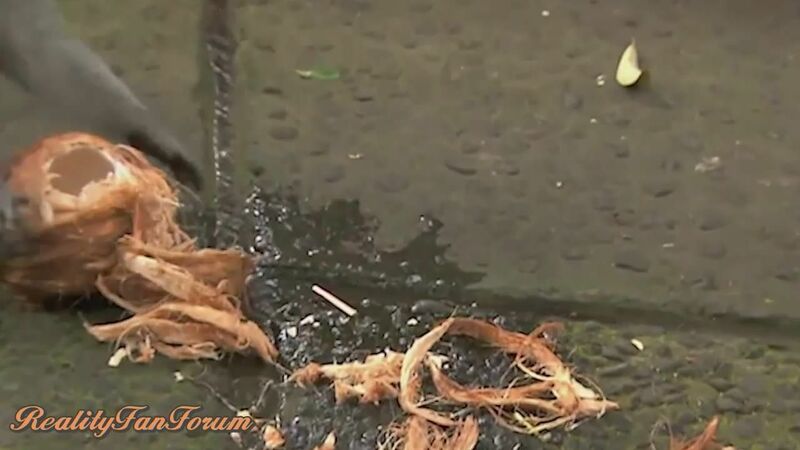 I have changed out the Detour video in post 2 to an HD one..thanks WP!! Alenaveda has done most all the caps, but if you need others, holler! So Jessica was stuck in Rakaia Gorge. Explain please Not sure what this means. It's just that, as Neobie pointed out, her watch is showing New Zealand time. oh, I was trying to think what evidence we had for a problem there! Here's an Instagram picture of Caroline and Jennifer hanging and trying to approve the offering. Just for clarification, Pura Desa Puseh Temple is the one Chateau found. Wikimapia labels it as "Pura Kayangan Puseh - Desa Pekraman Singakerta". "Pura" = "temple", "kayangan" = "heaven", "desa" = "village". So now that the temple's been accounted for, no need for a U-Turn! I guess John & Jessica give up on the Gebogan assembly for the Pura Desa Puseh Temple and switch over to do the Black Sand gathering in the river. My guess is that Pam & Winnie finish the Gebogan task first, then Caroline & Jennifer, followed by Bates & Anthony. Further guessing would make Max & Katie or Dave & Connor next and then Joey & Meghan and Chuck & Wynona. John & Jessica finish it last if they finish it at all. Are our dancers just for show or do we think there is a get a clue there? Have we seen Dave/Connor in any shots in Bali? If they get first it could be of the return of the FF in second leg of a KRL!! In the long preview they were seen at the NZ mat, in an airport, and at the Bali mat. 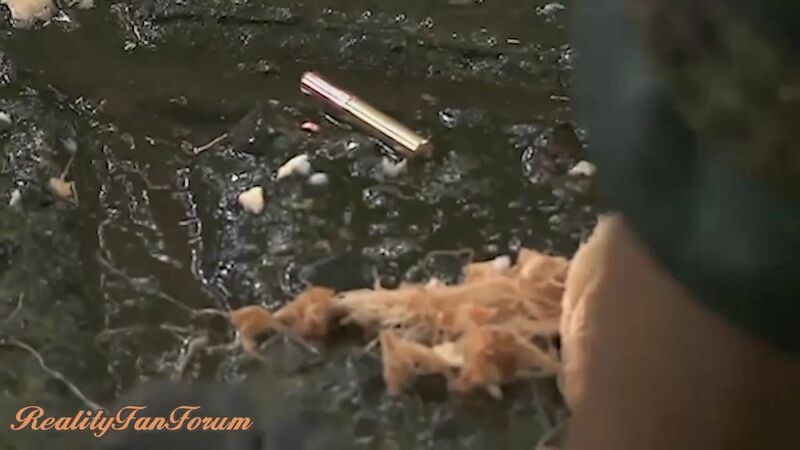 We also have them SIGHTED at the Bali mat...but I am not sure they were also SIGHTED actually doing the RB? Nyoman, can you help us with this? A FF would be a good answer! I should have seen this earlier! This shot was taken between 1:33 and 1:52 pm (assumes November 20th). Here's a new clip in Meghan's Ep 3 recap, it starts at 14.45. 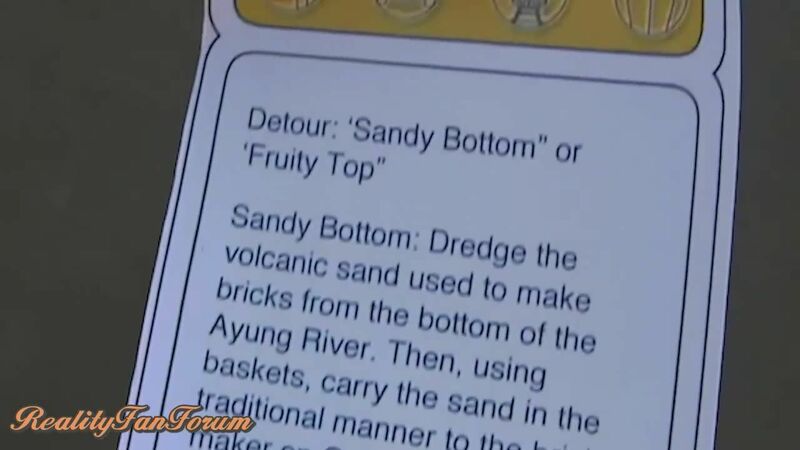 The monkeys get the detour clue for them from inside the coconut Detour is called Sandy Bottom or Fruity Top, maybe someone might be able to grab what the entire detour clue says? 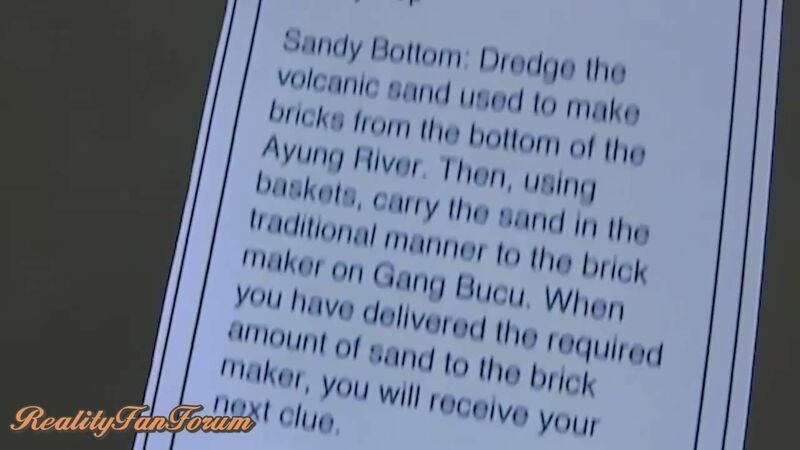 Sandy Bottom: Dredge the volcanic sand used to make bricks from the bottom of the Ayung River. 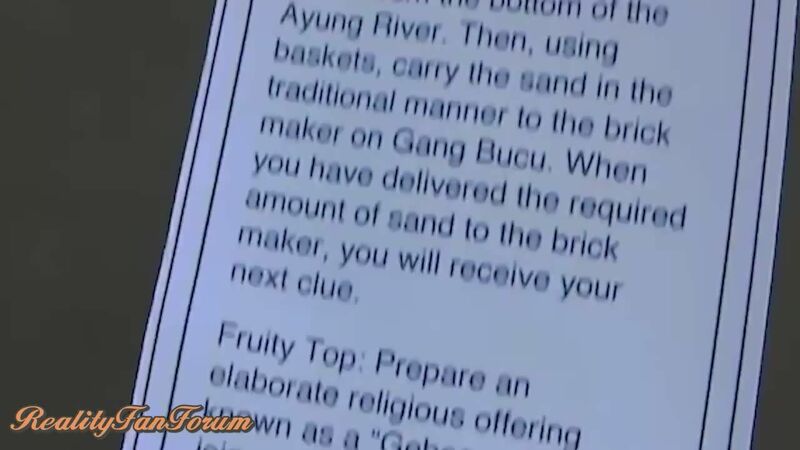 Then, using baskets, carry the sand in the traditional manner to the brick maker on Gang Bucu. When you have delivered the required amound of sand to the brick maker, you will receive your next clue. That's all I can see and then the first few lines of Fruity Top. I'm going to guess that Fruity Top is what we see Bates & Anthony completing in the promos which looks like completing a sort of fruit pyramid. Looks like the nearest part of the Ayung River is about 2 miles to the west of the Pura Desa Puseh Temple. Is this in ZouLy's report? Sorry , 2:35 PM . That was sayed by Neobie. Where is the link to this Declive? It is not the same as Zouly's report. Is this something you are summarizing from all the info?? It's a resume/summary of ZouLy's report and all the info we have! Okay, I would prefer that we use the TIMELINE for this info, that has LINKS to all the sources. This is based on an overheard comment from a team that we know jokes around with info. It MAY very well be true, but it does not have secondary confirmation. Also I think you may have John/Jessica confused with Max and Katie? As per Zouly's report, team "green shoes" is the team referred to...I think? I do not believe that team was ever ID'd as J/J, it is MAX that wears the green shoes. refers to the stop at Kenanga Terracotta Restaurant, Ubud, a possible route info. I think for now we need to use the ORIGINAL info and the TIMELINE as our factual basis, although I certainly appreciate your effort! I will bring Zouly's info over later tonight and add to the "summary" post. In the LAST 2 seasons....there was a FF in Leg 4. You could see a little note similar to the note Chuck and Wynona were seen with in the preview coming from the coconut the monkey Joey and Meghan were with. 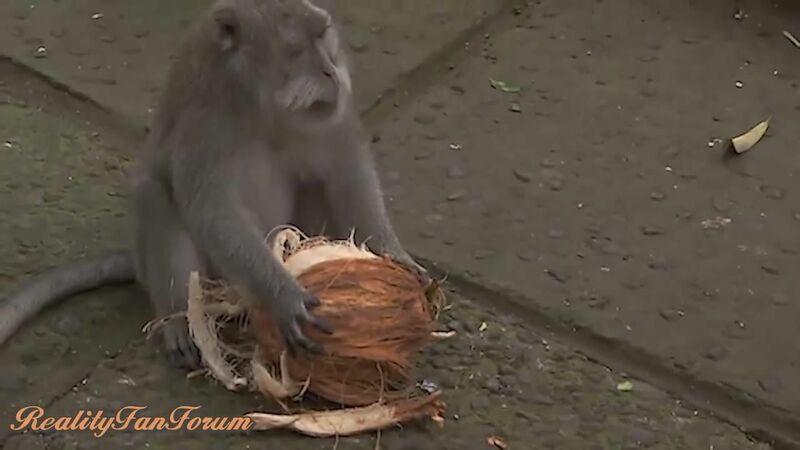 I think after the detour, they give a coconut to the monkey who gives them their next clue.